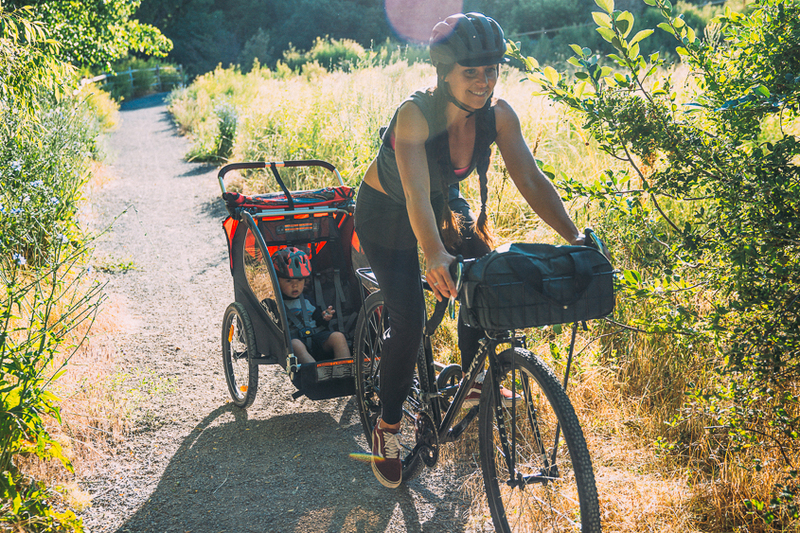 Your first step (after choosing your perfect bike trailer of course) is to make sure your own bicycle is in safe, working order. If you aren’t sure how to do a safety check on your own, you can bring it into a local bike shop. A tune up usually costs around $50 and is definitely worth the piece of mind, knowing you’ll be in good control of your bike and trailer. Before your maiden voyage with your precious cargo, practice manoeuvring on the road! While you may be an experienced cyclist (or not), it is important to feel what it is like moving around with a trailer behind you. Use this opportunity to brush up on the rules of the road in your area, then head out to a quiet street for your first ride. Once you are comfortable, you can try a busier street to test your comfort level. Next, ensure your baby has a well fitted helmet. Try out a few different brands before your buy, to make sure you have the best fit possible for your little one. We love the Giro Scout because it’s flatter profile in the back makes does not prevent your baby from laying back in the trailer, and it is adjustable, so you can make sure it is properly fitted as your baby grows. Now you are ready to bring your little one along! Remember cycling with your child is only recommended after 12 months of age, and once they have good head and neck control. By this time they are often mobile though, which brings us to our next item. For the safest ride, make sure your trailer has a 5 point harness like the Burley trailers. Babies and children can be very curious and a secure, well adjusted, five-point harness will ensure that they cannot crawl or slide out of their seat! Make sure your trailer has a bug screen and a rain cover. While you are biking, rocks or debris could fly out from your tires, or from vehicles around you. 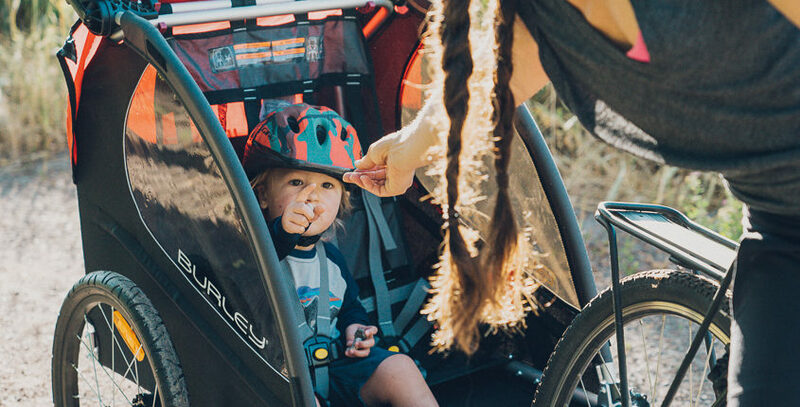 We love the Burley D’Lite as it has both covers and rear window ventilation as well to ensure your precious little ones stay a safe temperature, regardless of the weather outside. Before you head out, make sure you are visible to traffic. Another thing we love about the Burley trailers because is that they are marked with reflective tape and come with additional reflectors, making you visible in all weather and times of day. Wearing bright clothing yourself can aid in staying visible to passing cars. Now that you are safely outfitted, you are ready to go explore and make memories with your baby. One thing that’s certain, by making this choice to be active with your little one, you will encourage them towards a healthy, active lifestyle as well!